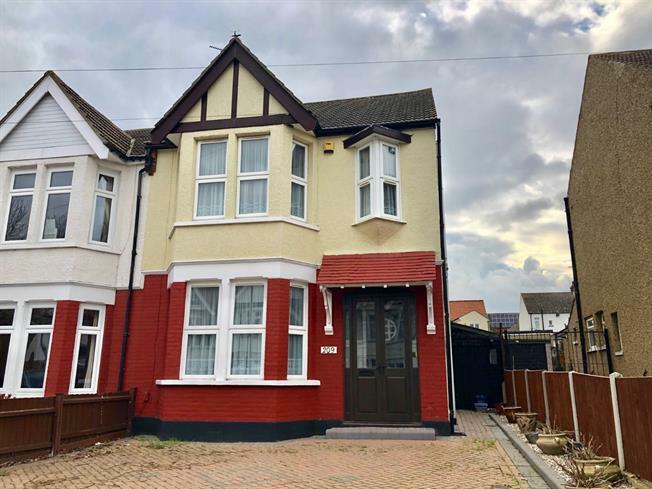 3 Bedroom Semi Detached House For Sale in Southend-on-Sea for Offers in excess of £350,000. We present this extended three bedroom semi detached house with an approximate 70ft west facing garden and a block paved driveway providing off street parking which is offered to the market with no onward chain. The additional accommodation comprises a living room, dining room/sitting room, modern fitted galley style kitchen, first floor four piece bathroom and a ground floor WC. Benefits include majority double glazing and gas central heating. Viewing is advised to appreciate the size, location and potential this property has to offer. Access via French doors to the porch and further door leading to the entrance hall. Textured, coved ceiling, picture and dado rails, built in under stairs storage cupboard, fitted carpet, radiator and stairs rising to the first floor accommodation, Two single glazed lead light picture windows to front aspect, obscure glazed panelled timber front door. Smooth coved ceiling with ceiling rose, picture rail, double glazed bay window to front aspect, concealed radiator, focal point feature cast iron fireplace with tiled inset and timber surround with raised tiled hearth. Fitted carpet. The sitting room area has a papered ceiling with ceiling rose, built in dresser style storage cupboards to chimney recesses, radiator and fitted carpet and is open plan to the dining area which has a Perspex roof, double glazed window to side aspect, double glazed widows and French doors to rear aspect and garden, radiator and fitted carpet. Smooth ceiling, double glazed window to rear aspect, door to side aspect and garden. Laminate flooring. A comprehensive range of matching, white, high gloss wall mounted and base units with breakfast bar, single bowl sink unit inset and tiled splash backs. Radiator. Space for free standing cooker with extractor above and spaces for appliances. Textured ceiling, obscure single glazed window to side aspect, dado rail, vinyl floor, low flush WC. Papered ceiling with loft access, picture and dado rails, fitted carpet. Smooth ceiling, double glazed bay window to front aspect, built in mirrored wardrobes to chimney breast recesses. Picture rail and fitted carpet. Smooth ceiling, double glazed window to rear aspect, radiator and fitted carpet. Smooth ceiling, tiled walls to picture rail, double glazed 'Oriel' bay window to front aspect. A four piece suite comprising a panelled bath with shower attachment, tiled shower cubicle, pedestal wash hand basin and low flush WC. Radiator and fitted carpet.